Hello! I worked all day, and I’m discouraged and tired. I had so many things I’ve been thinking about for a while, that I wanted to say here. While it was slow at work, I was going to sit and write it all down. But I couldn’t or didn’t. Instead, I’d like to tell you about this evening, after dinner. Standing in our dark but strangely balmy backyard I watched Malcolm, wearing a skeleton shirt, playing tag with Clio, wearing her customary smoky grey ensemble, with the flashing white at paws and throat. The white bones and white patches shone. They floated and dashed in-and-out of the darkness like the sprites they are, dodging and shining. They fell in and out of the mythical quince bush. They were berserker with the pent-up energy. I love them so much. Earlier today, Malcolm said, “Every person is a superhero, every person has a superhuman strength, because we’re all living skeletons.” Which leads to one of my inexplicably favorite moments as a parent…we were sitting in the car, driving back-and-forth to-or-from a warm house during the blackout, and Isaac said, “Why did the skeleton cross the road?” Before he could fill in the punch line, Malcolm cried out, “Because he wanted to SHAKE THAT!” I can’t explain, even to myself, why that fills me with so much joy. What a ramble this is! This masa harina bread is like a dense and flavorful cornbread. As you might remember, I’m a huge fan of masa harina. It’s like very fine corn meal, with a mysterious and lovely flavor. The batter for this bread does not give you confidence – it’s like pouring wet sand into your bread pan. And as it cooks, it’s sort of ugly and gnarled. But it’s lovely to eat. Isaac loved it to pieces. It’s quite a comforting loaf, and I seem to be stuck on comfort food this week! And I’m OBSESSED with this song. I play it over and over. It plays itself in my head in the middle of the night. It’s so pretty and cheerful and contagious, musically. And the lyrics are so hopeless and dire, but beautiful and sometimes it seems they’re true, but this was a hopeful week, politically! And there ain’t no use: no one can stop them now. Ain’t no use: nobody can stop them now. And everything is just for a while. It’s Bob Marley with Real Situation. Preheat the oven to 375, and butter a loaf pan. Cream the butter and sugar together till smooth and fluffy, and then beat in the eggs. Stir in all of the dry ingredients, and mix till smooth. Stir in the buttermilk. The mixture will be quite dense. Spread it into the loaf pan. Bake for about 40 minutes, till the top is firm and golden. 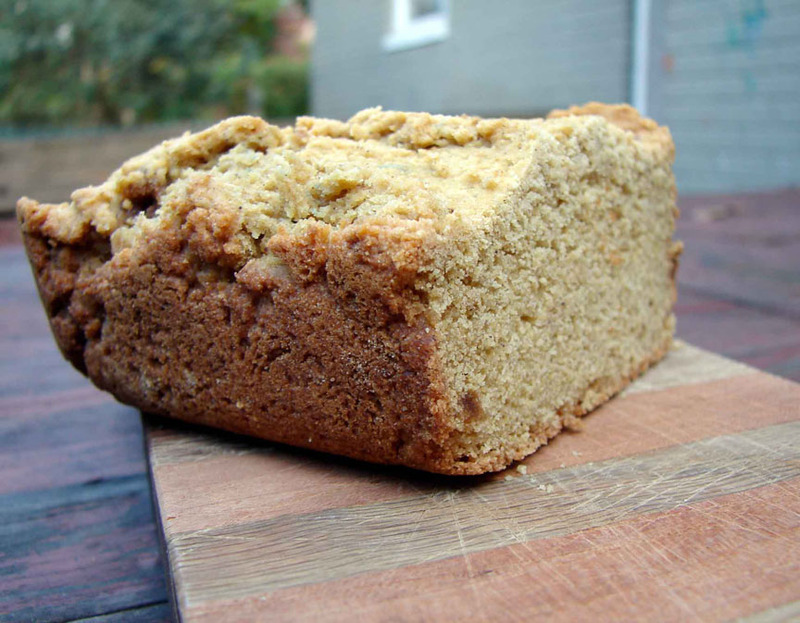 This entry was posted in bread, recipe and tagged corn bread, masa harina bread by Claire. Bookmark the permalink. Do you think this could be made with a vegetable oil instead of butter? Yes! I think that would be fine.